Instructions: Run your mouse over the histology slide want to view. Key histology features are described. If a link is present, click to view and listen to the histology audioslide. 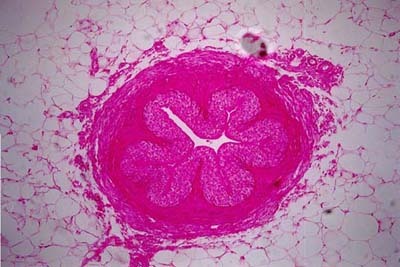 On a histology slide, the ureter has a star shaped lumen. This is due to the convoluted mucosa. The mucosa is lined by transitional epithelium which is visible on the high magnification histology slide (2). The muscularis consists of an inner longitudinal layer of smooth muscle and an outer circular layer of smooth muscle. On the periphery of this histology slide is adipose tissue.